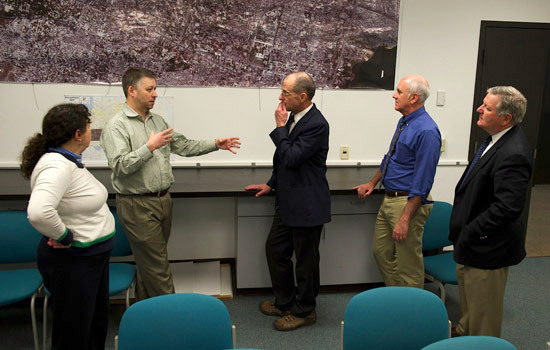 David Messinger, director of the Digital Imaging and Remote Sensing Laboratory in the Chester F. Carlson Center for Imaging Science, tells NASA astronaut Donald Pettit, third from left, about the center’s work for the World Bank after the 2010 earthquake in Haiti. Stefi Baum, center director, left, and Robert Constantine, director of planned giving, right, listen on. NASA astronaut Donald Pettit visited RIT’s Chester F. Carlson Center for Imaging Science on Thursday, Jan. 9, while in town to give a lecture at the George Eastman House on his space photography. Peter Blacksberg, a 1975 alumnus from the School of Photography, introduced Pettit to key members of the center: Stefi Baum, director; Joe Pow, associate director; and David Messinger, director of the Digital Imaging and Remote Sensing Laboratory. “Knowing that taking photos from space posed some unique problems, Peter suggested that Don connect with our researchers here, thinking we might be able to help address some of these challenges,” Pow said. Pettit asked specific questions about imaging the sun from the space station. Pettit has logged more than 370 days on the International Space Station and more than 13 spacewalking hours during his three times in space.